If you have been wondering why I have been quiet lately the following is your answer. If, like me, you were captivated by Gerald Durrell’s My Family and Other Animals when you were a kid you may also, like me, have been harbouring a a burning desire to go to Corfu – the setting for this wonderful book – well this May my long-held wish came true and found me (and him) about to embark on a memorable adventure – a walk around Corfu. While certain tracts of the coastline of Corfu have been swallowed up in tourist development, much of the interior is still instantly recognisable from Durrell’s description written during the five years that his family lived there in the 1930’s. 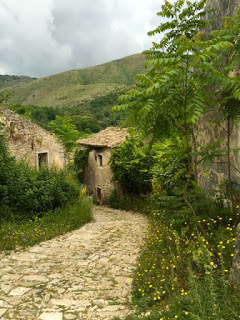 Historic pathways of the interior, connecting one village to another, are still ‘off the beaten track’ that lead you into a landscape that is both wild and ancient The patchwork groves of gnarled and towering olives, citrus and almonds are still there. So too the picturesque coastline, topped by a white domed monasteries that lead to shingle coves of stained glass coloured sea – then, on the scimitars blade in the south, to wild sand dunes, lagoons, wind blown arching grasses and wading birds. 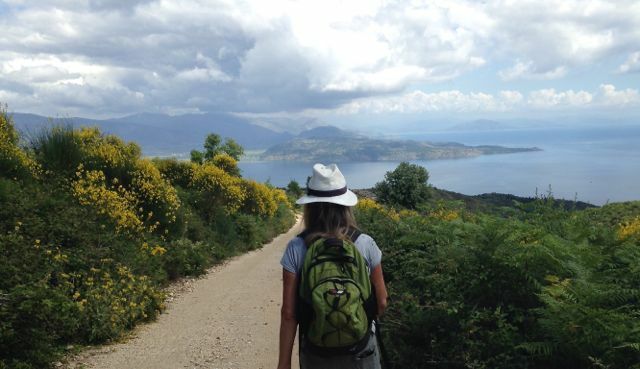 There might be more hotels, cruise liners and golf courses, but you can get away from it all on the Corfu Trail – you just have to start walking! The smell of the hilltops still lingers with me, wherever we walked was wonderful – heat, dust, wild sage, thyme with the occasional waft of something sweet and fragrant – jasmine or orange flowers. 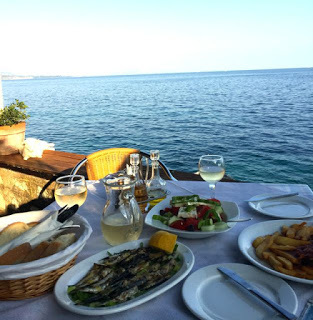 We felt very fortunate about the hotel we had booked in Corfu Town – sometimes you just get lucky with the internet! Housed in a Venetian villa with only nine rooms, our upper floor room looked out, through green-shuttered windows and balcony, to a courtyard dominated by a flowering 200 year old Magnolia grandiflora – then beyond, over the rooftops of the Old Town to the sea and mountains of Albania in the distance. Breakfast and afternoon tea in this courtyard were an absolute treat with homemade cake always on offer. 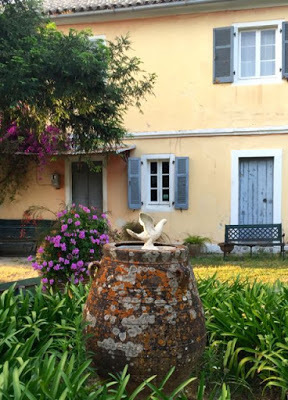 We woke in the mornings to the sounds of church bells, doves cooing, children playing and the smell of coffee brewing – a blissful way to start any morning and our holiday. 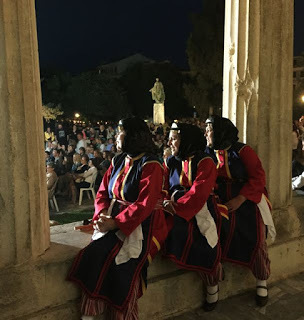 National folk dance festival – celebrating the day Corfu was unified with Greece after they chucked the British out. Held in the grounds of the Palace of St Michael and St George, built by the British and their seat of government when they were in power from 1815 to 1864. 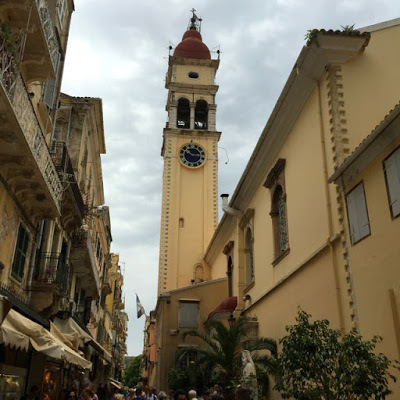 And, if this isn’t enough to make you want to hop onto a plane and fly to Greece, Corfu Town (the capital) is one of the most beautiful I have ever visited. A UNESCO World Heritage site dominated by elegant Venetian villas in faded pastel colours, a palace, two ancient fortresses, a sweeping bay, churches, a large park and esplanade (where they play cricket!) and bordering the esplanade the Liston – an elegant arcaded terrace of fashionable cafes and restaurants that rivals anything in Paris. The whole place has a kind of crumbling grandeur about it. 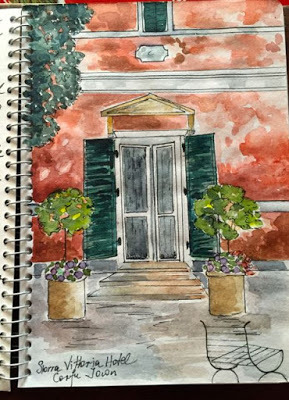 Corfu owes much of its elegant architectural beauty to its history of occupation; being variously overrun in the past by the Venetians, French, British and Germans but, they will proudly tell you – never the Turks. 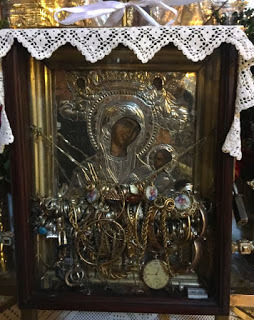 This, they believe, is largely due to the divine intervention of the patron Saint of Corfu, St. Spiridon whose relic i.e. mummified body – is held in the Venetian church that bears his name and dominates the old town. In 1716 a Turkish force of 33,000 men sailed to Corfu and laid siege to the city. The naval attack was repelled by the Venetians with Count Schulenburg in command, but the attacking Turkish land army laid siege to the city for 22 days; being eventually defeated when word spread among the Turks that St. Spiridon had been seen wandering through the streets with a lighted torch and, taking fright, they retreated and surrendered. NOTE: For classical music buffs: After the victorious outcome of the battle Venice honoured Schulenburg and the Corfiots for successfully defending the island by commissioning the great composer Antonio Vivaldi to write an oratorio – Juditha triumphant – one of only four that he composed in his lifetime. 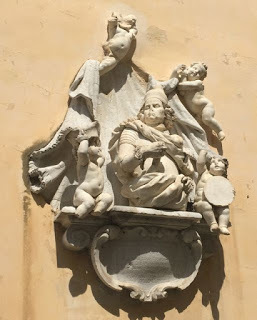 Venetian plaque on the wall of the Town Hall looking a lot like a triumphant Judith to me? NOTE: He cropped up later on in our trip on Sifnos island in the Cyclades – which has a tradition and history of ceramic making – old Spiro is also the patron saint of potters because he once used a shard of pottery as an analogy for the holy trinity being one thing but made from three – clay, fire and water. (This was at the First Ecumenical Council of Nicaea in 325AD). As he was explaining this the shard apparently turned to dust in his hand, which no doubt increased his ‘wow’ factor, and his fame spread. 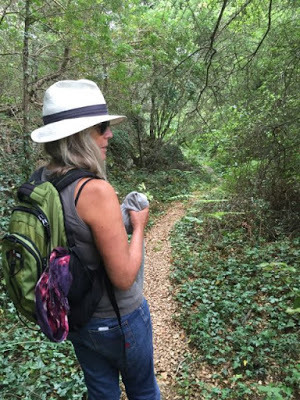 What finally got us there this year was not dear old Spiro but the discovery that a walking trail, from top to bottom – all 200km of it, had latterly been marked, mapped and documented – The Corfu Trail. This is a designated walkers trail with no vehicular traffic, but you might just find yourself sharing it with a farmer, his tractor and the odd flock of tinkling-bell’d goats, but that’s about as busy as it gets. 1. 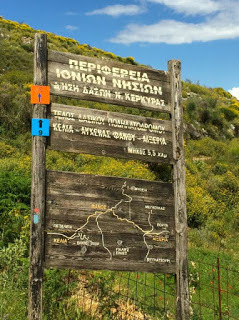 The trail notes accessed by downloading them from the website The Companion Guide to the Corfu Trail. They are PDF format and a few euros each – which you can get before you go. 2. The wonderfully detailed Corfu map by Freytag and Berndt 1:50,000 available in bookshops in Corfu Town (I love a good map!). When all trail markers had disappeared this saved our bacon many times when we were wonderfully lost, yet again. We decided to stay in a small hotel on the north east coast (close to where the Durrells lived) Nissaki, hire a small car and access the Trail for day walks. This turned out to be ideal for us as we could swim every morning, before breakfast, in an azure blue cove just below the hotel; easily get to wherever we wanted to by car and come back to the same place every night without having to keep packing up and finding new accommodation. I had pre-booked this hotel before we left Australia and were fortunately able to extend our stay as we were outside the high season of mid-July to August and it was inexpensive – 35 euros per day. 1. We gave a lift to a German woman (Karen from Berlin) who had stayed at our hotel for the night, and was about to set off on the last day of a ten day trip, starting in the south and finishing in the north, and covering the whole 220km in one go. She just had a small pack, carrying everything with her and found somewhere to stay every night. The previous night, high up in the hills, she had slept on the floor of a shepherds hut!. 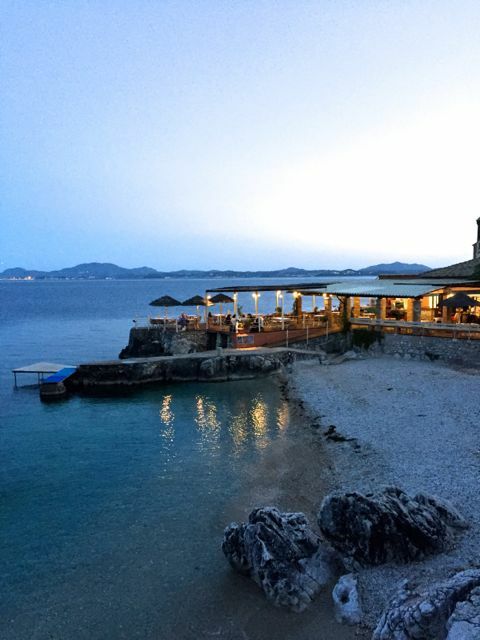 She, like us, did find, that much of the accommodation in Corfu is pre-booked through agents and, unlike in other parts of Greece, it’s sometimes difficult to find casual accommodation. 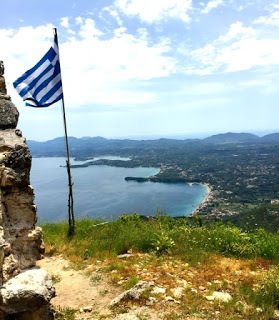 Walk 1: From PORTO to OLD PERITHEA via the highest peak on Corfu – PANTOKRATOR (980m). 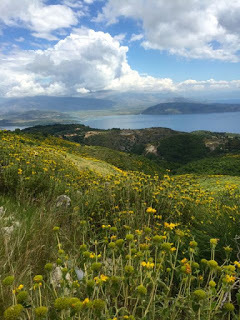 What magnificent views of the Albanian coastline, heady fragrance of all the wildflowers – too many varieties to count – and the air abuzz with so many insects and butterflies. The way not clearly marked and we took a wrong turn finding ourselves heading down to the coast instead of inland. Had a fortunate encounter with some other walkers – the only people we saw that day – who put us right and told us we should have turned up behind the goat shed! Backtracked about 4km and eventually found our way to the base of Pantokrator and the ruined village of Old Perithea – once the capital of Corfu in the 14th century and now a village of 130 ruined stone buildings – which are gradually being restored – with, thankfully, four working tavernas, being a regular stopping off point for those climbing to the summit. 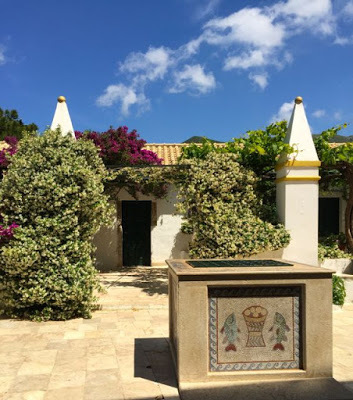 We wandered around happily among the ruins, donkeys, chickens and burgeoning vegetable gardens with people starting to re-inhabit this tranquil place – there is even a 4star B&B, The Merchant’s House. With lunch under our belt we headed back to Porto and our hire car parked in the grounds of the old church. About 12km round trip and an absolutely wonderful day’s walking. Walk 2: SPARTILAS to PANDOKRATORAS IPSILOU (ruined church) with wonderful views down the coastline to IPSOU and DASIA. The comment in my diary after this hike was “The Corfu Trail is either going to turn me into an Olympian or a hospital case – I suspect the latter”. This was a challenging walk that climbed and descended steeply – often clambering over large boulders. 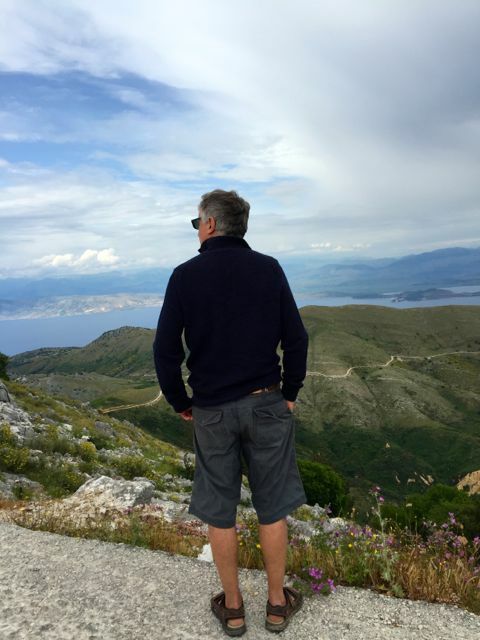 What it did though was give us spectacular views of the coastline to the south and Corfu Town and across the Ionian sea to Epirus (Albania and Greece) and the Pindus mountains – which I am dying to go and explore. The absolutely best thing about walking is that you leave the madding crowd behind – you rarely meet a soul. Corfu has long-been a mecca for British package tourists, Italian holidaymakers and cruise trip day-trippers, which can be really overwhelming in the town and resorts but, up here, you have it all to yourself and it’s heaven. Walk 3: SOKRAKI to VALANIO and the waterfall at NIMFES through ancient olive groves and holm oak forests. Having taken the advice of Spiro, the walking guide we had met the previous day, we set out to do a circular walk to some of the northern inland villages that started in SOKRAKI – a two donkey wide village where the locals gave all sorts of advice about where the Corfu Trail might start – none of it helpful – eventually being put right by olive wood turner, whom we spotted in a little workshop (Spiro!!) who spoke good English.We were headed for some of the loveliest and remotest villages on Corfu that are full of myth and legend, walking past groves of flowering orange and almond trees. 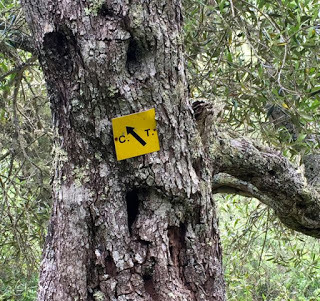 Such a contrast to the previous walks – now in quite dense shade from towering olive trees – some over 7m – marvellously gnarled, mossy and full of fist-like holes. 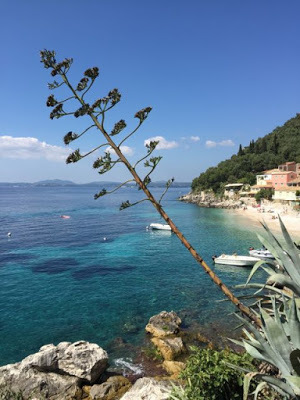 Everywhere else we have ever been in Greece – from the Peleponnese to Santorini – the olive trees are radically and regularly pruned, but not on Corfu and I don’t know why? 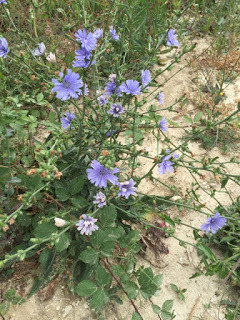 Spotted many new species of wildflowers, butterflies and birds (and lots of shotgun cartridges!). After, what we thought was going to be a 6km walk which turned into 10km, and getting lost again, we just about made it to the village of Horepiskopi before a sudden and torrential downpour shrouded the valley in a veil of mist. We just made it in time to the local cafe before the rain came down in drenching sheets. Thankfully dry, and with a spanakopita and coffee inside us, we called it a day and got a taxi back to our car. It cost us 25 euros but, I think I would have paid 100! 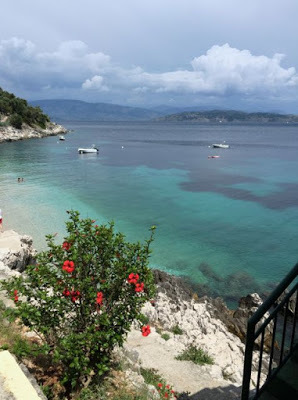 Started in the very pretty bay of Kaminaki, next to where we were staying at Nissaki, and took the Corfu Trail past some lovely bays and coastal headlands ending up at Kalami where Lawrence Durrell lived with his wife in the White House. 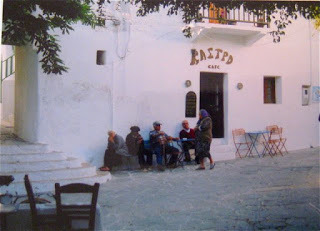 It’s still there – has a taverna underneath and been turned into a guest house. This whole coastline has long been the playground of a certain kind of holidaying Brit and is known as Kensington on Sea – I spotted the first cravat I have seen in a long while. It has also been a permanent home to many of them – just like the Durrells – who were refugees from a post colonial era, not being able to settle in Britain after their birth-lands gained independence when the Empire crumbled. 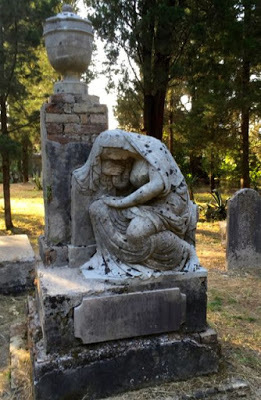 The poignancy of this struck me when I was wandering around the British Cemetery in Corfu Town – just how many of those British people who had ultimately called Corfu home and subsequently died there, had been born in the far-flung corners of the Empire like India or Malaya – just like Ma Durrell – or maybe they just couldn’t stand the weather in Britain after living in places with heat. This is a marvellous ‘swimming’ and ‘boating’ coastline dotted with azure bays and climbing cliffs punctuated with cypress and olive trees. The ruggedness of the coastline also means that the road stays at the top and you can only get to the more secluded bays on foot or by boat – just the way I like it. Ended up for lunch in the bay of Agni – which has three tavernas with most folk arrive by boat which get parked by the jetty boys employed by these very busy tavernas One of them is famously run by Theo (Taverna Agni) and we were advised to go and chat to him about nipping over to the mainland as he conducts trips there focussing on food. Unfortunately, the day we picked he was way too busy to chat so we just had to be content with quick lunch, cold drink and make our way back to Nissaki for a well-earned siesta. Epirus will have to wait for another time. 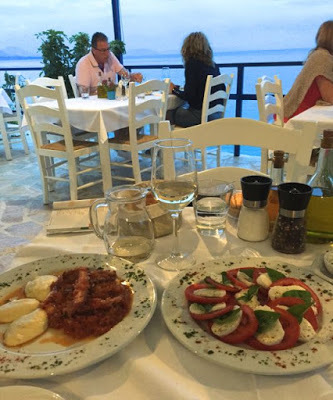 We had dinner to look forward to at our taverna at Nissaki – ‘Mitsos’ run by Agatha and her family.Best homemade taramasalata (she made it with finely sieved potato instead of bread), meatballs and daily specials – here we were having gavros (fresh anchovies) – my favourite. I’m not a fan of chips, but she made the best, crispy with creamy yellow flesh. The half litre of local white wine was cold and good too AND the very best meatballs in tomato sauce. Unlike most Greek food these are spicy with chilli and cinnamon. 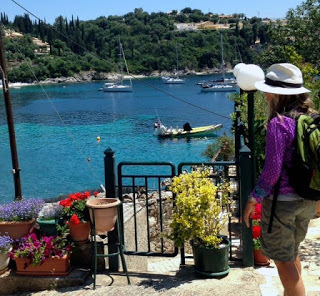 When we asked our fellow Trail walker, Karen, what had been the highlight of her journey on the Corfu Trail, she nominated this walk for the fantastic coastal views – and she was not wrong. 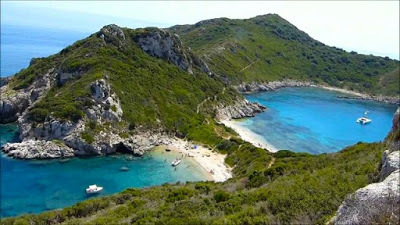 PALEOKASTRISTSA has a series of stunning cypress studied bays that fall down to spectacular rocky coves and beaches with mouthwash sea all a’bob with impressive looking yachts flying the colours of every nation. The downside is that the hillsides and beaches are crammed with holiday villas and tourists, with bus loads of day-trippers heading for the historic Theotokas monastery dedicated to the Virgin Mary and dating from 1228. 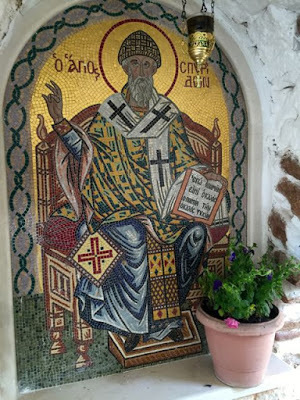 The monastery is well worth a visit, if you can find a quiet time – it has a beautiful garden, olive press in a cave and stunning iconography and adornments in the church. We were there on a day when coach loads of Orthodox Russian tourists had arrived from a visiting cruise ship in Corfu harbour. 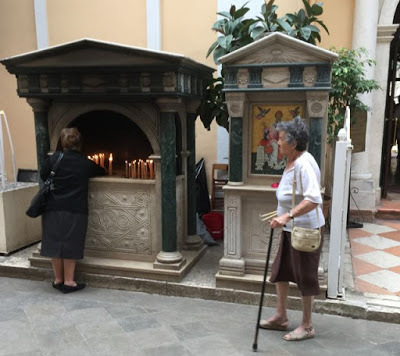 Crammed into queuing behind them I was transfixed as the women shrouded themselves in headscarves, kissed the icon of the Virgin Mary and genuflected so low that their hair swept the floor, back and forth several times. 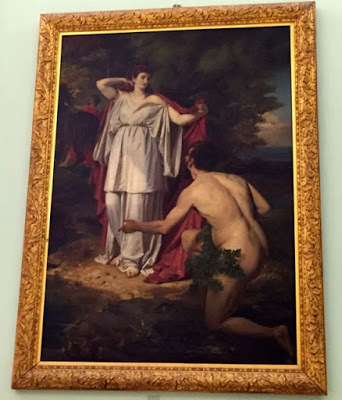 There is also something else that attracts visitors – the bay of Paleokastritsa is steeped in Homeric myth and supposed to be the place where Odysseus’ ship was wrecked (the rocky headlands said to resemble the ship) and, in his nakedness, where he first clapped eyes on Nausikaa. If you are staying in Corfu Town there are many places of interest that you can walk to including the English Cemetery; The Old and New Fortress, the Old Port and cobbled backstreets, the produce market in the old moat, Mon Repos (villa where Prince Phillip was born) Achilleon Palace (a short bus ride), the Esplanade and Liston (catch a cricket match on Sunday afternoons) and a fine Archeological Museum. We took a walk, in the fading evening light, to the English Cemetery which I had seen featured on a travel series on DVD by Joanna Lumley called Greek Odyssey. I loved the genuine passion she showed for Greece and some of the out-of-the-way places she visited and shared – not the regular journey that these kind of shows normally take. For an overview of Greece, I highly recommend it. 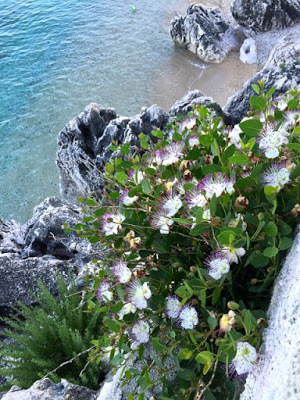 Clinging to every rock face and an important part of Greek cuisine – capers and samphire – we are in the land of hunter gatherers! BOURDETO A fish stew, usually made from scorpion fish, in a tomato based sauce and flavoured with red pepper, both hot and sweet. PASTITSATHA Rooster cooked in cinnamon, cloves, nutmeg and paprika and served with pasta. AVGOTARAHO Smoked fish roe from PETRITI on the south coast is one of the gourmet treats – like botargo – it is the salted , sun-dried roe of the grey mullet. The Corfiots preserve it by coating it in beeswax. A delicacy, like caviar, it’s usually sliced thinly and served with olive oil, pepper and lemon and paired with fruits such as dried figs. 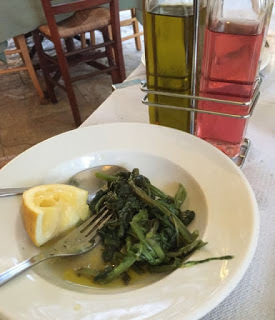 TSIGARELI In the horta tradition of wild greens, they sauté them on Corfu (usually chard) with onion, garlic, olive oil, chopped fennel leaves and red pepper. This was a favourite and we had this most days. Not being a fan of ‘greens’ this was an absolute first for me – so tender, not stringy, and delicious. 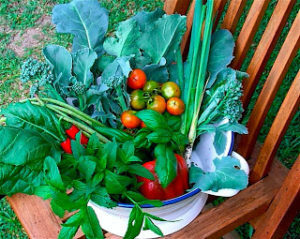 An important part of the Mediterranean diet, wild greens can come in many shapes and sizes and it’s often hard, for a non-speaker, to pin down what it actually is and can be; chicory, lambs lettuce, dandelion, chard, silver beet, samphire, beetroot tops and even leaves from the tamarisk tree – to name but a few. They are always served with fresh lemon and olive oil. We had many memorable meals, but one of the best was at a cliffside restaurant in the north-east, Caryatids. There we had a typically Corfiot meal of octopus stew, spiced with paprika and cinnamon, accompanied by local potaoes, creamed and flavoured with nutmeg. Oh, and don’t forget the nod to the neighbours with an Italian salad, insalata caprese – local tomatoes and cheese with fresh basil. Yum – and I can’t wait to go back. Truly lovely, dear Diane. What a marvellous trip. Thank you very much.